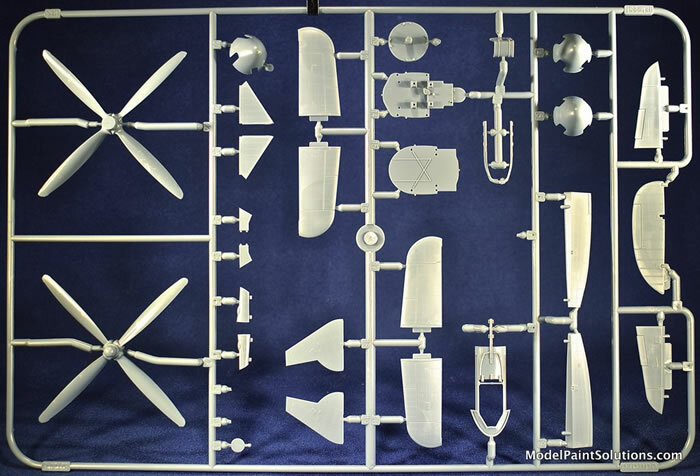 171 parts in grey plastic (not all are used), 14 clear parts, one color PE fret, canopy and wheel masks, and one decal sheet with markings for 6 aircraft. 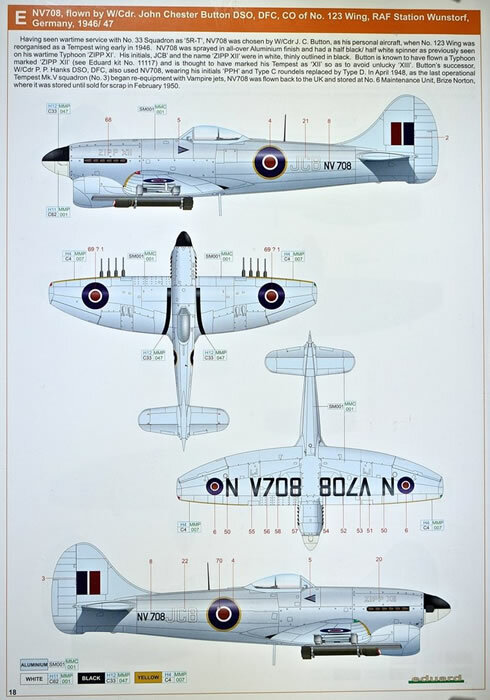 Beautiful surface details and inscribing; full cockpit with color PE panel and harness; all the parts required for a Tempest Mk.V, series 2 including late-style large 4-spoke wheel hubs, short Hispano gun barrels, and rockets. 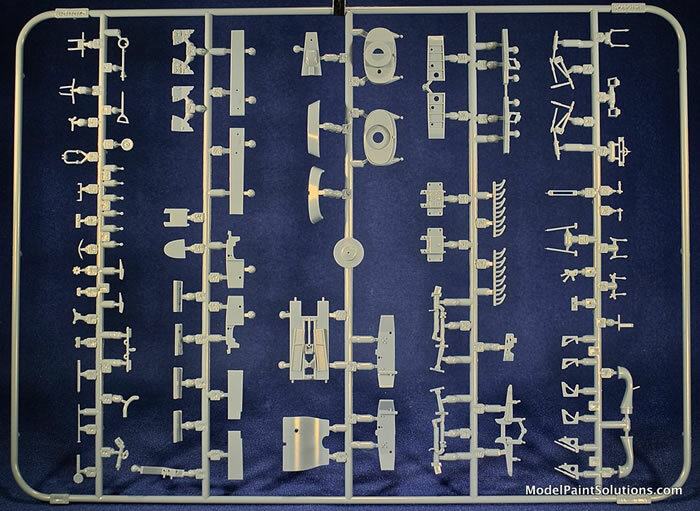 Once again Eduard has produced a state-of-the-art kit that is replete with beautiful surface details and crisp molding. Starting with the Hawker Fury and followed in succession by the Hart, Hurricane, Typhoon, Tempest, and Sea Fury: the Hawker stable is comprised of some of the most beautiful aircraft to ever take wing in this reviewers’ humble opinion. 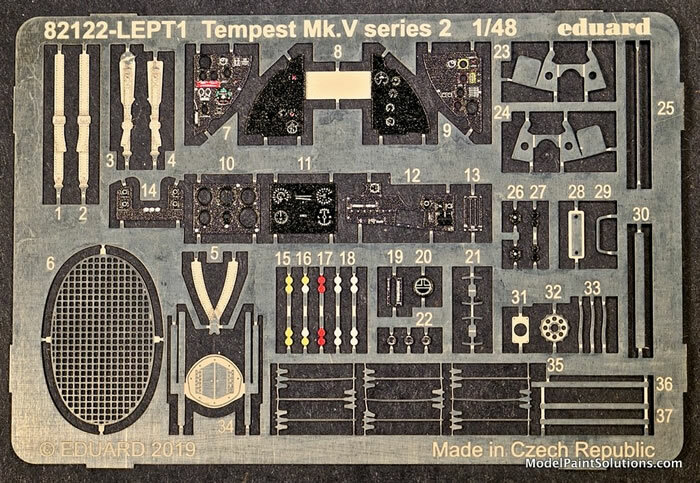 That being the case I’ve been looking forward to Eduard’s new-tool Tempest kits for some time and I’m not let down. The wait was worth it. 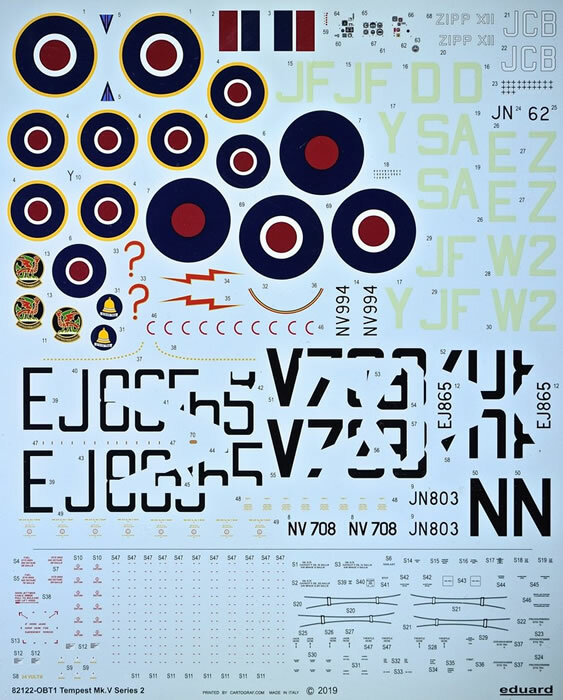 This kit is gorgeous with an abundance of finely rendered surface details and inscribing that must be seen to be appreciated: let’s get to it. 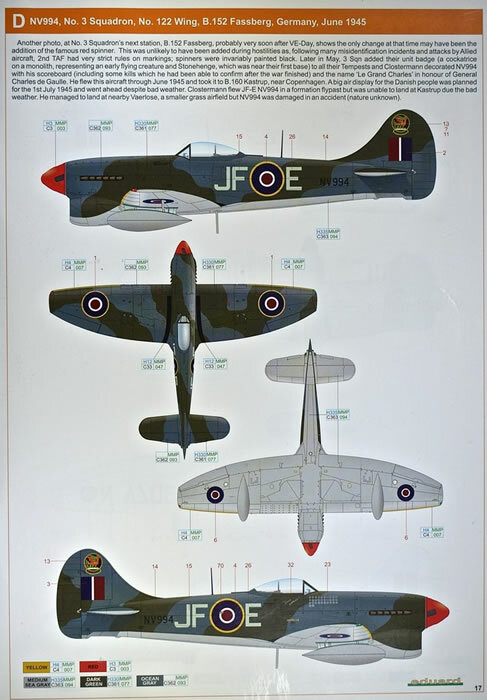 The Hawker Tempest is a British fighter aircraft primarily used by the Royal Air Force (RAF) in the Second World War. The Tempest, originally known as the Typhoon II, was an improved derivative of the Typhoon, intended to address the aircraft’s unexpected fall-off of in performance at high altitude by replacing its wing with a thinner laminar flow design. Having diverged considerably from the Typhoon, it was decided to rename the aircraft Tempest. The Tempest emerged as one of the most powerful fighters of World War II and was the fastest single-engined, propeller-driven aircraft of the war at low altitude. 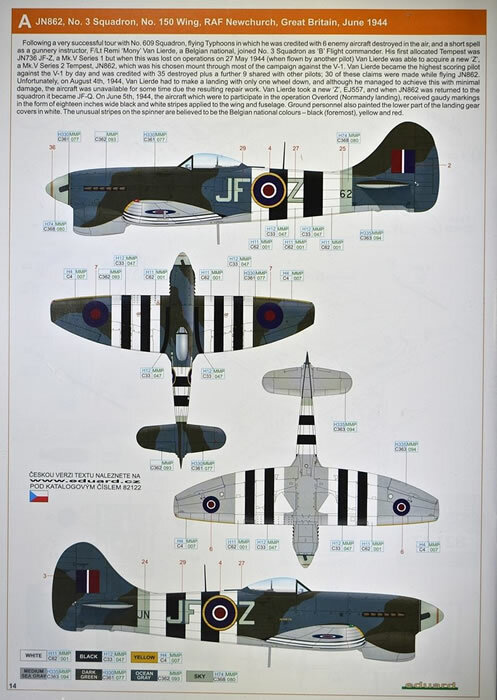 Upon entering service in 1944, the Tempest was used as a low-level interceptor, particularly against the V-1 flying bomb threat, and as a ground attack platform, in which it supported major events such as Operation Market Garden. Later, it successfully targeted the rail infrastructure in Germany and Luftwaffe aircraft on the ground, as well as countering such attacks by German fighters. The Tempest was effective in the low-level interception role, including against newly developed jet-propelled aircraft such as the Messerschmitt Me 262. During production of the first batch of 100 Tempest V Series I’s, (distinguishable by their serial number prefix JNxxx), several improvements were progressively introduced and used from the outset on all succeeding Tempest V Series 2’s, with serial number prefixes EJ, NV, and SN. 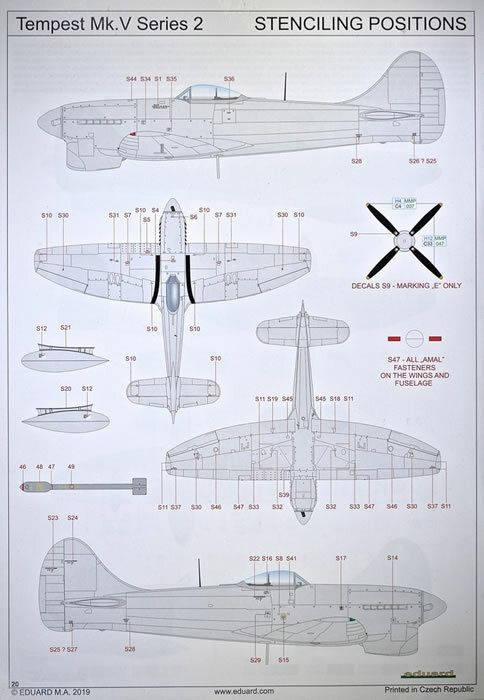 The fuselage/empennage joint originally featured 20 external reinforcing "fishplates", similar to those fitted to the Typhoon, but it was not long before the rear fuselage was strengthened and, with the fishplates no longer needed, the rear fuselage became detachable. 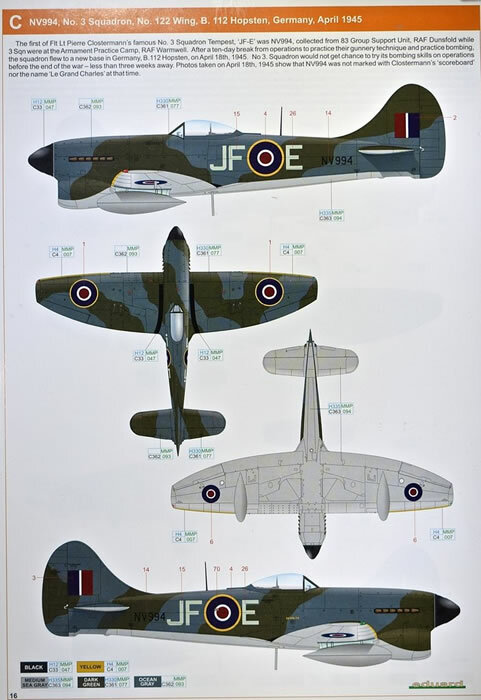 The first 100 Tempest Vs were fitted with 20 mm (.79 in) Hispano Mk.II’s guns with long barrels, which projected ahead of the wing leading edges and were covered by short fairings. Later production Tempest Vs switched to the short-barrelled Hispano Mk.V’s, with muzzles flush with the leading edges. Early Tempest Vs used Typhoon-style 34 by 11inch (83.4 by 28 cm) five-spoke wheels, but most had smaller 30 by 9 inch (76.2 by 22.9 cm) four-spoke wheels. The new spar structure of the Tempest V also allowed up to 2,000 lb (907 kg) of external stores to be carried under the wings. 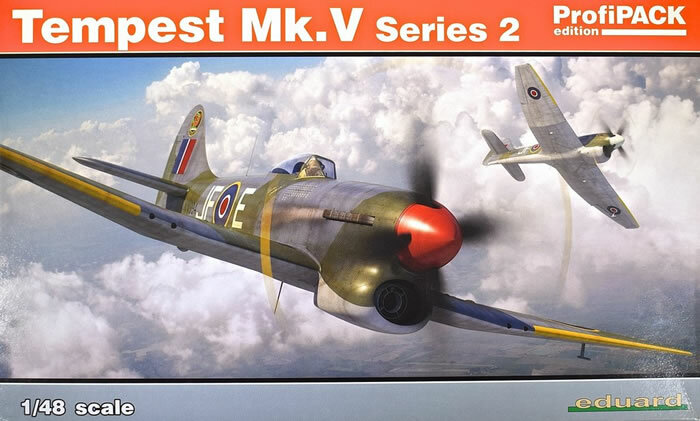 In June 1944, the first of the V-1s were launched against London; the excellent low-altitude performance of the Tempest made it one of the preferred tools for handling the small fast-flying unmanned missiles. Tempest squadrons soon racked up a considerable percentage of the total RAF kills of the flying bombs (638 of a total of 1,846 destroyed by aircraft). Using external drop tanks, the Tempest was able to maintain standing patrols of 4.5 hours off the south coast of England in the approach paths of the V-1s. Guided by instructions from coastal radar installations, Tempest pilots, positioned and ready for a typical pursuit, would use either cannon fire or nudge the V-1 with the Tempest’s wings, causing the missile to tumble out of control. Flying a Tempest, French ace Pierre Clostermann claimed the first Allied combat encounter with a Dornier 335 in April 1945. In his book The Big Show (pp. 273–274) he describes leading a flight of four Hawker Tempests from No. 3 Squadron RAF over northern Germany, when he intercepted a lone Do 335 flying at maximum speed at treetop level. Detecting the British aircraft, the German pilot reversed course to evade. Despite the Tempests' considerable low altitude speed, the Royal Air Force fighters were unable to catch or maneuver into firing position on the twin-engined Do-335. In air-to-air combat, Tempest units achieved an estimated air combat success ratio of 7:1, accomplishing a 6:1 ratio against single-seat enemy fighters. The top-scoring Tempest pilot, Squadron Leader David C. "Foobs" Fairbanks DFC, was an American who joined the Royal Canadian Air Force in 1941. In February, 1945, while flying with 274 Squadron, “Foobs” was shot down and made a POW after destroying 11 or 12 German aircraft (with one shared), making him the highest-scoring Tempest ace. 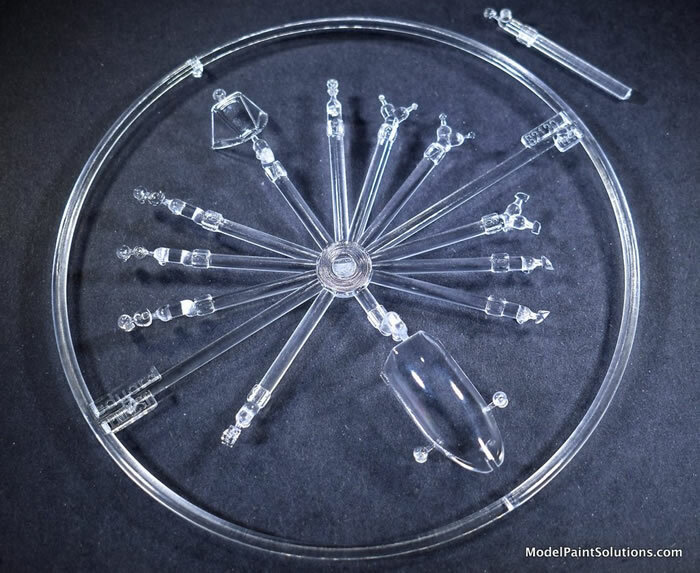 Arranged on five sprues of light gray and two of clear, the new Eduard Tempest. This kit is worlds away from their first 1/48 Tempest of 1997, an example of which resides in ye olde stash: of course one does. 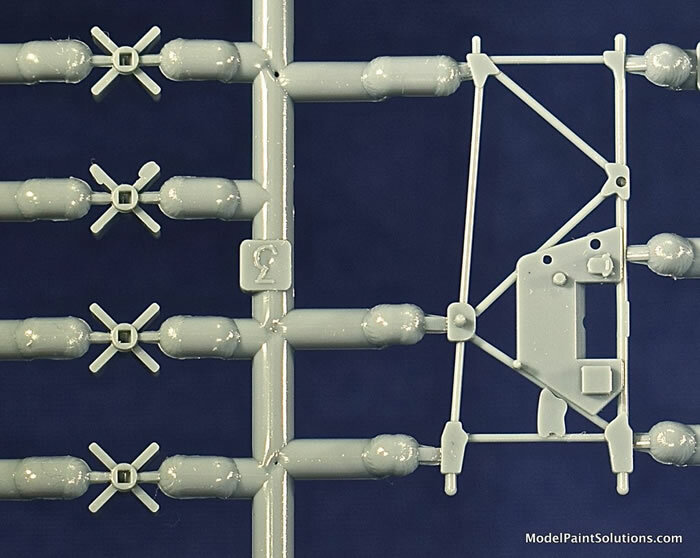 As with their family of 1/48 Bf-109’s, the surface features are simply beautiful: a combination of inscribed and in-relief details that are rendered with scale-appropriate finesse. The longer and closer you look, the more detail there is to see: awesome. 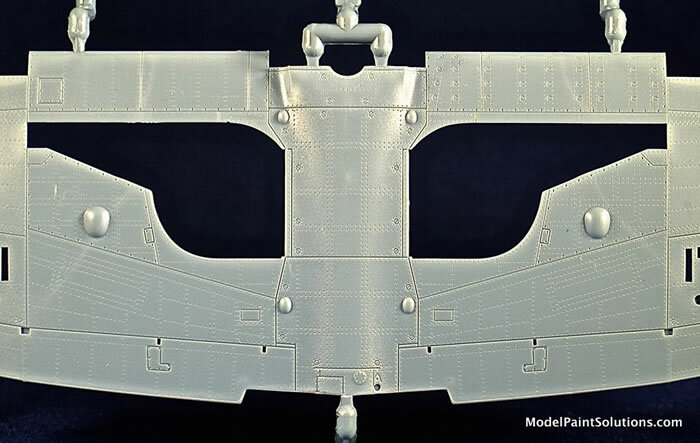 Of note are the individual, slot-head, Dzuz fasteners, and subtle riveting within and surrounding access panels on both the wings and fuselage: simply beautiful. Right out of the box the cockpit features a beautifully done color PE instrument panel and harness that will look awesome with the canopy posed open. The tubular framing surrounding the cockpit, a common feature of the Hawker pedigree, is beautifully replicated. 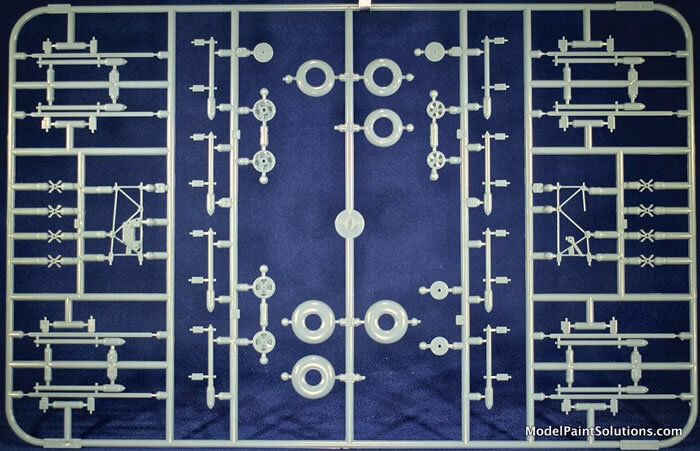 Multiple color PE panels with associated levers/handles augment the level of detail here. 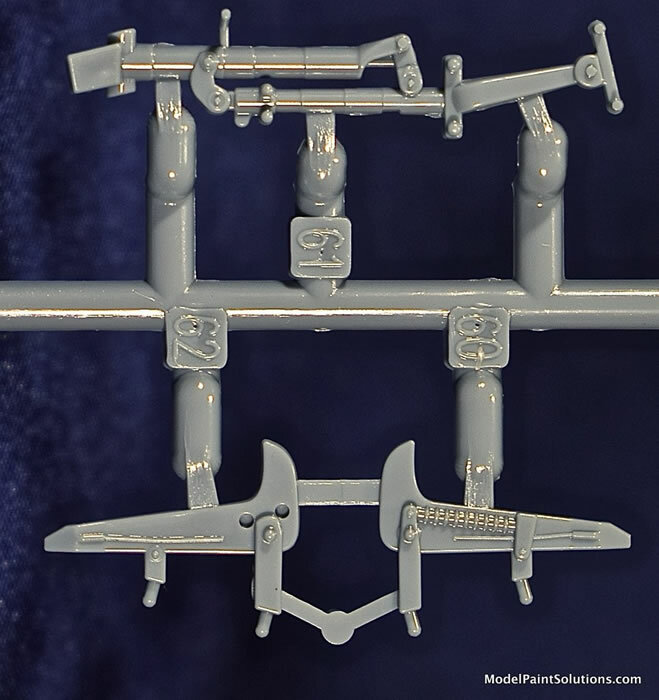 Of note are the two nicely detailed gun sights, each with it’s own mount, that are scheme-specific so be aware. 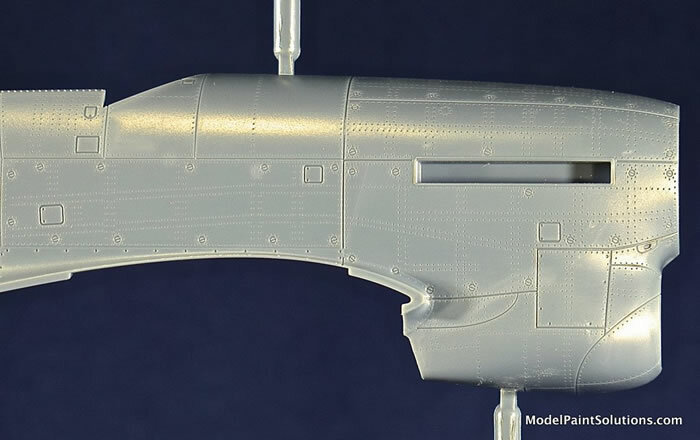 The fishplate reinforcements on the aft fuselage are provided in PE and will look quite crisp when applied. The wings have the conventional layout of full-span lower wing with left and right upper halves. As with fuselage, the surface details on the wings are both inscribed and in relief. 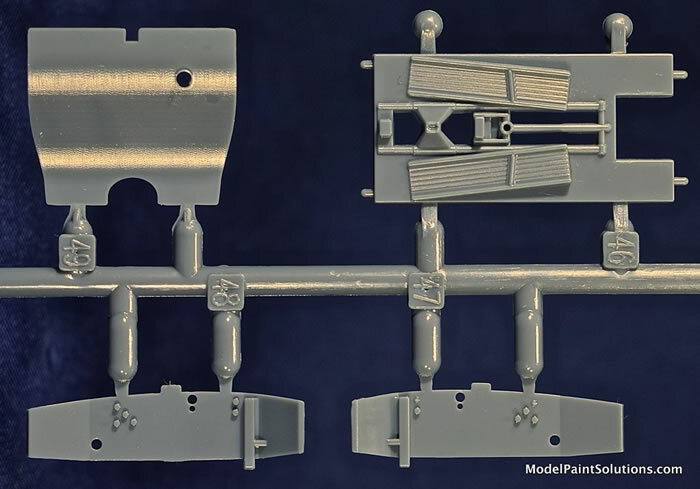 The wheel wells, each composed of 14 parts, will look very convincing under paint and a little weathering. The rudder, ailerons, and elevators are poseable and composed of single-piece parts whereas the horizontal stabilizers are comprised of upper and lower halves. 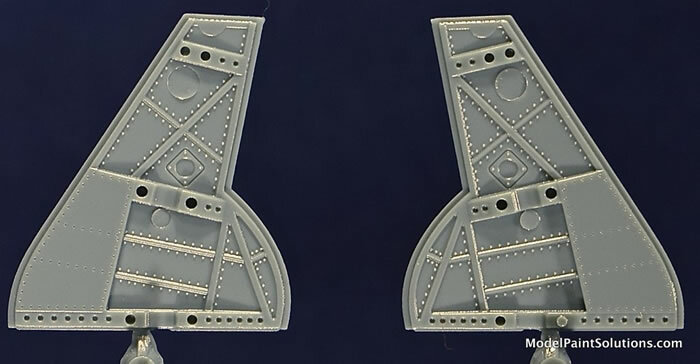 The landing gear parts are nicely detailed and crisply molded. Both the early balloon-style tires (Mk.V, series 1) and the later, smaller, tires with the appropriate 5-spoke wheel hubs common to series 2 production are provided. The tires are molded with no “weight” so you might want to consider aftermarket replacements or use some modeling tricks to confer the appropriate weighted look. 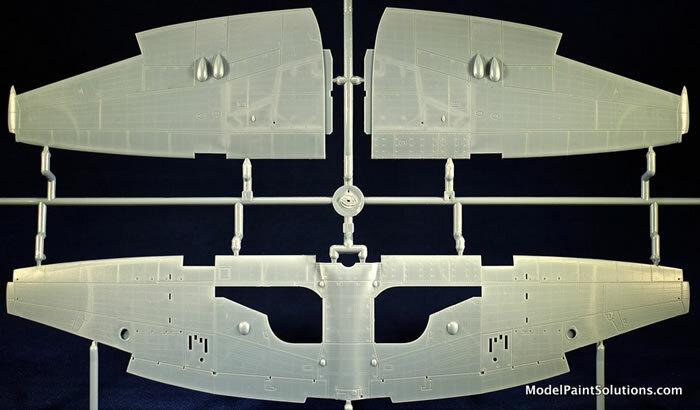 The canopy parts are crystal-clear and crisply molded with scale-appropriate framing and details: exactly what we’ve come to expect from Eduard. 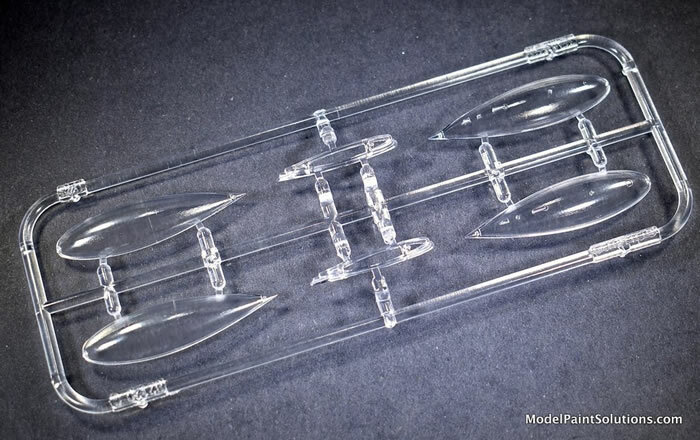 Should you wish to put a load on your Tempest a selection of nicely molded rockets with launch rails and drop tanks (on a clear sprue to provide the clear faired mounts) are provided. Die-cut paper masks are provided for both the canopy and the wheel hubs. 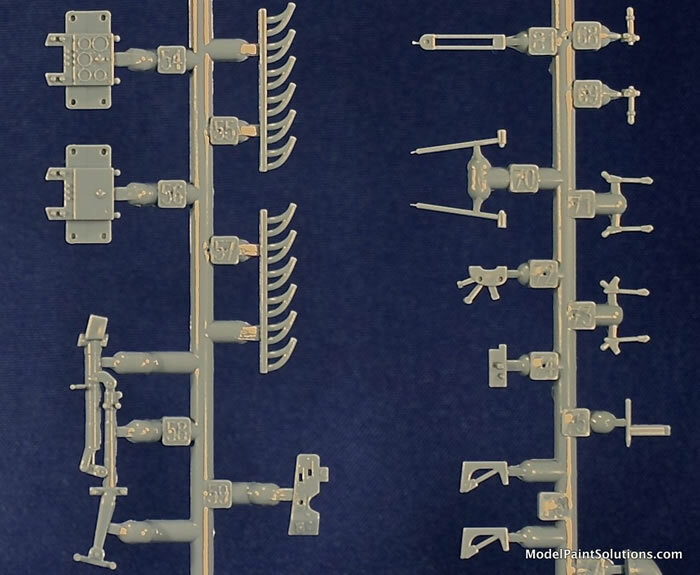 This kit is beautifully molded, dripping with detail, and just begging to be built. I see no issues laying in wait and suspect this will be an easy and enjoyable build. 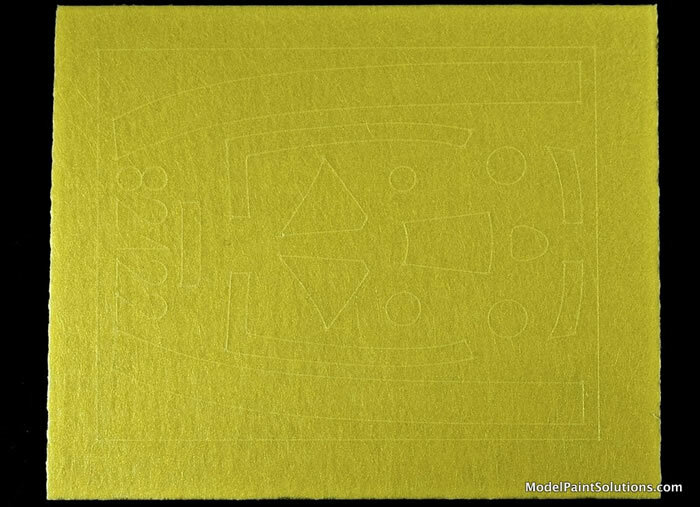 The quality decal sheet, printed by Eduard, has perfect registration and good color densities. JN862, No. 3 Squadron, No. 150 Wing, RAF Newchurch, Great Britain, June 1944. JN803, No. 486 (RNZAF) Squadron, No. 122, B.80 Volkel, the Netherlands, October 1944. NV994, No. 3 Squadron, No. 122 Wing, B.112 Hopsten, Germany, April 1945. NV994, No. 3 Squadron, No. 122 Wing, B.152 Fassberg, Germany, June 1945. NV708, Flown by W/Cdr John Chester Button DSO, DFO, CO of No. 123 Wing, RAF Station Wunstorf, Germany, 1946/47. As my stash attests, I’ve been a fan of Eduard kits for a long time. 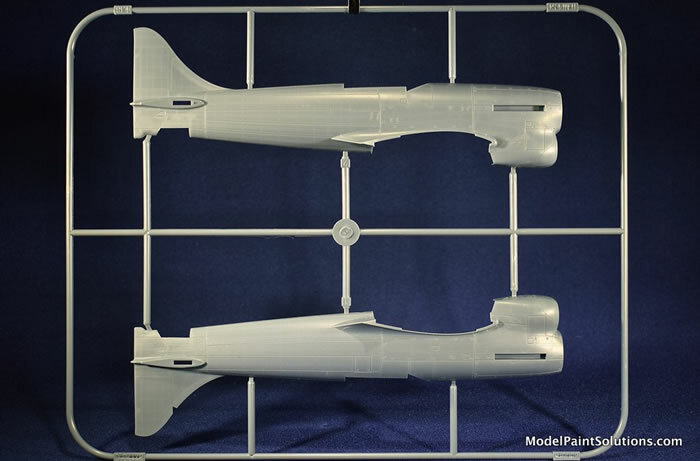 This company has consistently set the standard for quality, state-of-the-art, injection-molded, scale aircraft. 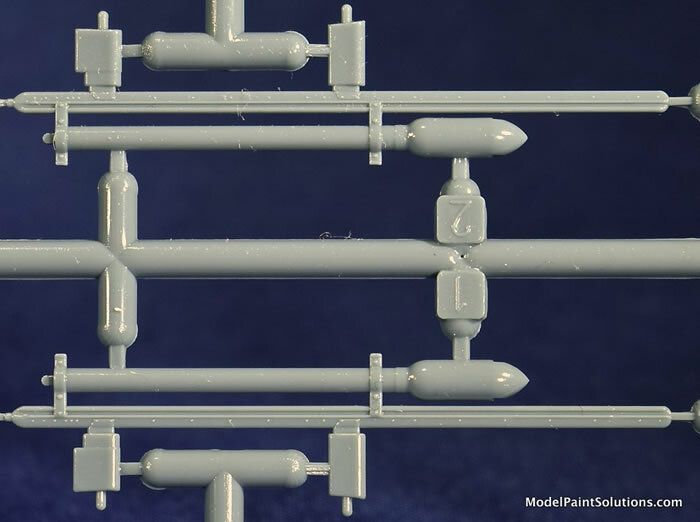 That said, the melding of inscribed rivets and fasteners along side rivet heads, rendered in scale-appropriate relief as seen on this new-mold Tempest may push that standard a bit higher.